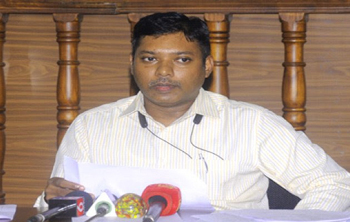 Mangaluru, May 05 2018: Briefing media at the DC’s court hall on May 4, Friday, DK DC and Returning Officer Sasikanth Senthil has warned of initiating appropriate action against those who seek votes on the basis of religion and caste. The DK DC said seeking votes on the basis of religion is a crime, even if such an act is carried out in a non-public space. Action will be initiated based on proper evidence on those who violate the rules, he said. The deputy commissioner said that May 7 is the last date to avail voters’ slips distributed by the Election Commission. The slips can be availed from the booth-level officers. But the voters’ slip is not compulsory to cast the vote. Voter’s identity cards and other 11 documents recognised by the Election Commission will be considered as the identity of the voters. The voters’ slips distributed by the commission will include photographs of the voters along with the map of the polling booth and other details. After May 7, the non-distributed voters’ slips will be given to the custody of ERO and will not be distributed later. The details of the polling booths can also be availed through ‘Chunavana’ mobile app, he explained. A total of 10,980 polling staffers will be deployed on duty, including 3,992 men and 6,988 women. All polling staffers will cast their votes through postal ballots. The polling booth staffers will attend the second round of training on May 6. Also, the micro-observers, supervisors, assistants and Group D staffers who will be deployed on the day of vote counting, will undergo training on May 5. Central paramilitary forces will be deployed at the polling booths on the polling day. Dry days : There will be dry days in the district from 6 pm on May 10 till 6 pm on May 12 and from 6 pm on May 14 till 12 pm on May 15, the deputy commissioner said. For any queries on election, members of the public may contact the election control room on toll free number 1800-425-2099. Additional Deputy Commissioner Vaishali was present.